The Football Association has confirmed Leeds United owner Massimo Cellino is facing an 18-month ban from the game pending an appeal by the club against the Italian’s punishment. The FA broke its silence after it emerged on Wednesday that Cellino’s role in an illegal payment sanctioned during Ross McCormack’s transfer from Leeds to Fulham in 2014 will result in a long suspension and a £250,000 fine. United’s owner has been found guilty by the independent commission which heard the evidence against him during a two-day hearing at Wembley in September. The commission, which was chaired by Nicholas Stewart QC, had delayed the release of its verdict amid legal wrangling over whether an announcement might prejudice an appeal from Cellino. The written reasons behind the decision have not been made public, despite the FA’s announcement. Cellino, who is on the verge of selling a 50 per cent stake in United to Italian businessman Andrea Radrizzani, denied breaching FA rules by agreeing to pay an unlicensed advisor of McCormack’s £185,000 after the striker’s transfer to Fulham went through in July 2014. Leeds as a club pleaded guilty to breaking the FA’s agent regulations and will receive a separate fine of £250,000. Cellino’s ban is due to begin on February 1 - barring him from any involvement at Elland Road until August 2018 - and he is to attend an FA education course “covering the duties and responsibilities of an owner and director of an English football club” before the end of April. Leeds and Cellino have notified the FA of their intention to fight the penalties. A statement from the FA said: “The club and Mr Cellino have indicated that they contest the sanctions imposed by the regulatory commission and intend to issue an appeal in accordance with FA Rules and Regulations. United are likely to argue that the club’s fine is disproportionate to financial penalties levied in similar cases, including the transfer of Calum Chambers to Arsenal in 2014 and Brighton’s purchase of Dale Stephens from Charlton Athletic that same year. Arsenal and Brighton were fined £60,000 and £90,000 respectively. The Elland Road club also believe that the decision to hit Cellino with a personal misconduct charge is at odds with other cases where clubs have been the sole target of disciplinary action surrounding illegal payments. Cellino was charged in May with an individual breach of FA rules in May while Leeds were alleged to have broken agent regulations. Derek Day, the licensed agent who acted for McCormack in 2014, has received a £75,000 fine and an 18-month ban, 11 months of which has been suspended. He, like Leeds and Cellino, was accused of facilitating a payment to Barry Hughes, a Glasgow businessman who worked as an unlicensed advisor for McCormack. 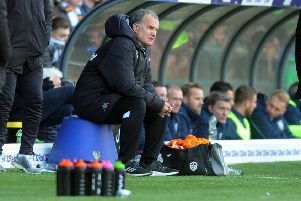 In the midst of the uncertainty, the club’s focus will return to a highly-promising Championship season tomorrow night as Leeds visit second-placed Brighton. A win over Albion, who yesterday announced annual losses of almost £26m for the 2015-16 year, would moved United to within four points of the automatic promotion places and head coach Garry Monk refused to play down talk of his squad making the top two. “When you start out somewhere, everyone should have a dream and an ambition and it should be of the highest standard,” Monk said. “We want to give people dreams and make those dreams reality. We’re fighting as hard as anyone else and as I said right at the start, the ambition was always to get back to the Premier League. Brighton lost in the play-offs last season having led the Championship for a lengthy period but the club’s form under Chris Hughton has continued unabated since August. “They are where they are because they deserve to be there,” Monk said. “They’ve been a bit unlucky, especially last season where had things gone slightly differently they could have been up in the Premier League now.